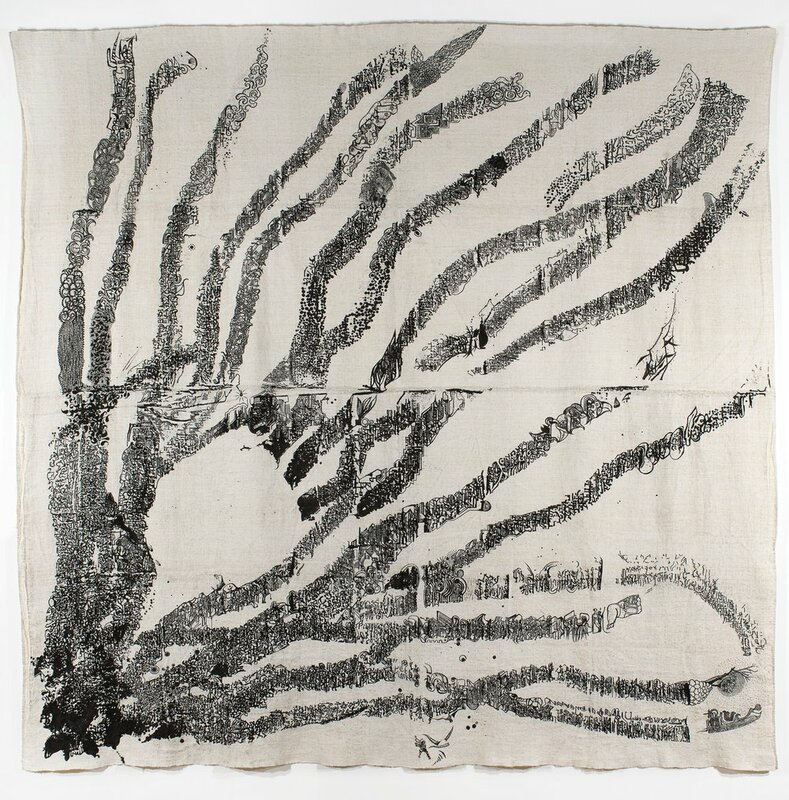 International artist Bjorn Amelan exhibits his Ink Paintings on 18th and 19th Century Linen at Peters Projects, his first exhibition of these works in the southwest, opening June 8, 5-7pm. Longtime part-time resident of Carson, New Mexico, Amelan has completed seven new paintings and one sculpture for this exhibition. Amelan’s extensive career in the United States began in 1993 when the artist moved to stateside to begin an ongoing collaboration with Bill T. Jones and the Bill T. Jones/Arnie Zane Dance Company designing and creating as the Resident Set Designer and then Creative Director. Sculpture was always the focus of Amelan’s artwork, until he traded in his sculpture side-practice for the more transportable medium of hemp-ink on coarse antique bed sheets several years ago. Amelan sources his canvases from French textile dealers and meticulously paints with sumi and colored inks an imagined land where the eye never ceases to wonder. Bjorn Amelan was born in 1955 and is of Israeli/French descent. Amelans work is in the collection of Agnus Gund, Melva Bucksbaum, the 21c Museum Hotels and other prominent collections.